Definitive stamps from 1967 to date. I am adding these to my sales lists as time permits. If the colour of the SG No is anything but green it is already in my sales catalogue and clicking on it - will take you straight to it. 2005.009.02 has Cream Gum (the others have a "bluish gum"). There are subtle differences between the 2008 issue and the 2004/5 versions (the value is set lower and the shade is slightly different). SG doesn't recognise this in the "Y" Series. 2010.009.01 is only available from the London 2010 Miniature Sheet. 1996.010.02 has a White Back. 2010.010.03 is only available from the London 2010 Miniature Sheet. 2011.010.02 no source or date codes. T2a cuts. 2011.010.03 no source or date codes. T2 cuts. Originates from William Morris PB (DX53). Inverted Print. 2011.010.04 no source or date codes. T2 cuts. Originates from William Morris PB (DX53). Sideways Right Print. Only available in coil format used on the offical RM FDC. 2009.016.01 is only available from the British Design Classics Prestige Book (DX44) and is a completely different shade from 2007.016.01. 2009.17.2 originates from Treasures of the Archive Prestige Book (DX46). 2009.17.3 originates from Naval Uniforms Prestige Book (DX47). 1993.019.02 and 1995.019.01 are found in Coils only. The main difference between 1993.019.01/02 and 1994.019.01 is the gum. The former is PVAD and the latter PVA which is whiter and matt in comparison. 1999.019.02 and 1999.019.03 have a 4.5mm short band whilst 190.13.3 has a 5mm short band. 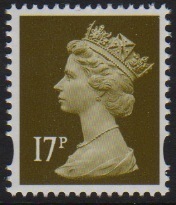 1999.019.03 originates from the mixed value £2 (FW11) booklet. 1999.019.04 originates from the World Changers Prestige Book (DX23). 2000.019.01 is only found in Special by Design Prestige booklet (DX24). 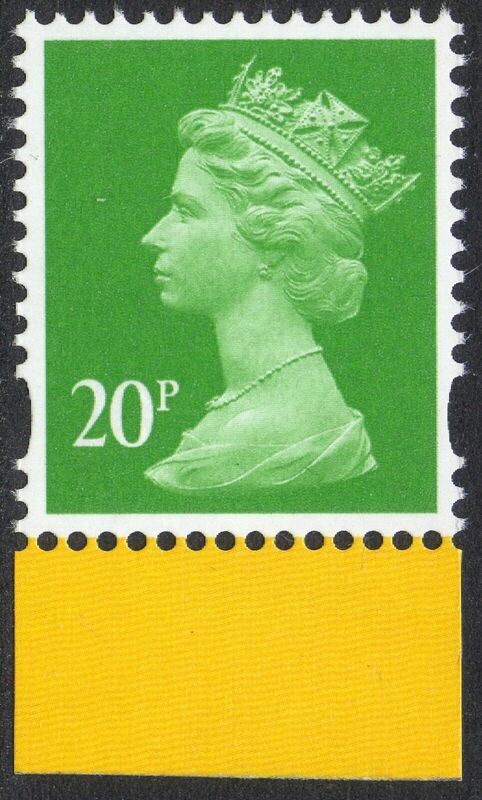 The coloured part of this stamp is 0.5mm smaller than normal issues. This was caused by a computer software glitch. 2000.019.02 is only found in Special by Design Prestige booklet (DX24) and is an important variety. 1994.019.02 and 1995.019.03 have a 4mm band whilst 1995.019.04 has a 4.5mm band. 1995.019.03 and 1995.019.04 both originate from the National Trust Prestige Book (DX17). The former is from the multi-value pane of 9 and the latter from the pane of 6; hence two entries. 1995.019.04 has a 4mm band whilst 1995.019.06 has a 4.5mm band. 1995.019.05 and 1995.019.06 both originate from the National Trust Prestige Book (DX17). These are different panes hence two entries. The above listing is only intended to be used as a Deegam to SG Specialised comparison. Please let me know of any errors you spot. It is NOT intended to be a complete listing of the Deegam Handbook. All are issued as Sheet stamps only unless the "INFO" column shows any of the following; Items with "BP" are stamps found in Booklet Panes only, "CL" are stamps found in Coil format or "MS" are stamps found in Miniature Sheets only. In addition the "INFO" column will identify the different paper brightness varieties from the sheet issues of the "Byfleet" era of 2003-2004. Bright Paper will be signified by "TRB", Intermediate Paper by "TRI" and Dull Paper by "TRD". Change to Royal Mail Specification paper is signified by "TRB". Printed (PRT) by (E) Jon Enschedé en Zonen, (H) Harrison & Sons, (Q) Questa Colour Security Printers, (W) Walsall Security Printers, (JW) John Waddington Security Print, (D) De La Rue or (C) Cartor. Printing methods used (next to the value) are "(G), (L) or (R)" representing Gravure (or Photogravure), Lithography or Recess respectively. Phosphor bands (PHOS) are printed vertically on the face of the stamp and are visible under UV radiation or at an oblique angle to a light source. 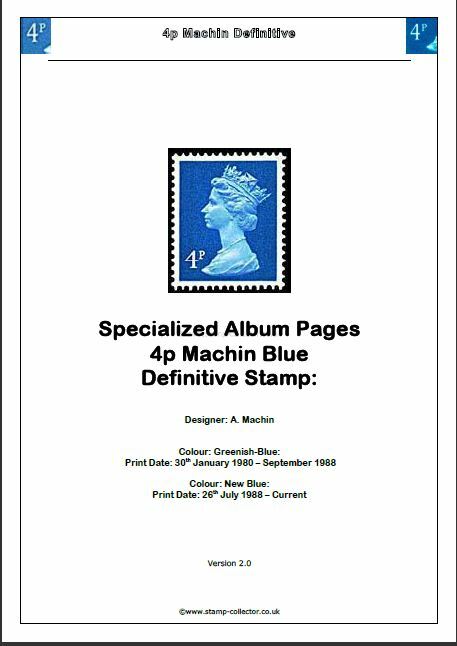 Stamps are printed with: (2B) 2 phosphor bands, (CB) centre band, (LB or RB) left or right bands, or on (PCP) phosphorised paper. The use of "(Y) or (B)" in the "PHOS" column indicates "Yellow" or "Blue" Fluorescence. This is only used if more than one type exists within any one variant. Images are representative only and the Date shows first year of issue.